No they're not. They're just limited, but the flip side of that is they provide a small canvas for creativity, like the the social world of a Jane Austen novel. In fact, however, it may be true that the socks I make have been boring. That is partly because I am a relative beginner at sock knitting, but mostly because conservative socks are more wearable, especially for my sock recipients who like things simple. To wit - I call these Red Devil to jazz them up (and in honor of the audio book, The Devil in the White City). Raveled here, they are made with two skeins of Lana Grossa Meilenweit 50 Seta/Cashmere, a merino, silk, acrylic, and cashmere blend, and very soft with it. They are Schurch socks, of course, the Embossed Stitch from More Sensational Knitted Socks knit at eight stitches per inch on 2.25 mm needles (5 dps) on 64 stitches for a circumference of eight inches. Meet the Bordhi Baby Boot, raveled here. 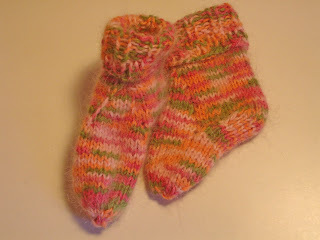 This is the first sock suggested in Cat Bordhi's New Pathways for Sock Knitters. Bordhi calls the structure Sky architecture. It is made top down with an pyramid-shaped expansion over the instep and a simple short row heel that I want to try again. It wasn't until I made the second sock that I sort of understood how to make it. But only sort of. I somewhat fault her directions here. It is, however, elegantly simple. Bordhi presents eight unusual sock structures, or architectures, in her book, and some of them are very beautiful. I want to try them all, but most are toe up, so I have to get with her cast ons and, especially, bind offs. The Baby Boot is made with a fraction of a skein of Louisa Harding Kimono Angora, a dk weight, on # 3 double pointed needles. I have an embarrassing amount of this yarn which is good for nothing but baby wear. I can hardly contain my excitement over the socks I am currently making. 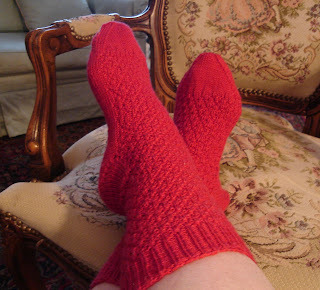 I did manage to adapt the Learn to Knit Afghan zig-zaggy pattern to socks in the round. So far, I love the results, and feel that the finished sock will warrant a pattern posting. But we'll see about that when they're done. Meanwhile please visit my work blog called Sounds - Music at Niles PL. I don't work on it much , but I couldn't resist rating the Season 8 American Idol performances. I put up a big American Idol display at the library to help generate interest in our CD collection. If you are an AI fan, let me know if my ratings match yours. The Devil in the White City is a fabulous book. A friend who is originally from Chicago recommended it, and I loved it. And your red socks are fabulous too. You definitely did justice to that delicious yarn.